The Growth of the Economy of our country, Nigeria is greatly dependent on the Agricultural sector. Our young graduates who should embrace Agriculture are ignorant on ways to go about different farming ventures. Even though they do embark on an Agricultural venture they do fail. Here is a Free Agribusiness empowerment training for Nigerian Youths to attend. 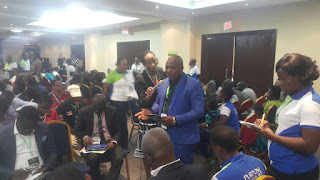 The CEO of HighHill Agribusiness Development Center and president of Nigeria Association of Plantain and Banana Stakeholders, Mr. Adeniyi Sola Bunmi, has decided to organize a 100% free Agribusiness empowerment training for Nigerian Youths to mark his birthday and also as an avenue to express his social responsibility and give back to the community. It entails training Nigerians who have a strong passion for agriculture and farming on dry season practical training on Moringa, Plantain and Vegetable farming in Nigeria. 100% Organic Agriculture and some other useful tips to practice a successful agribusiness. It will sure be an interactive training. Eligibility: Nigerian youth between the ages of 18 and 45. 1. All participants are expected to fill this form and providing correct information. Also bear in mind, that originality and willing to travel on a self-finance basis to the venue is of importance. 2. Selection is very competitive as training is free and materials and refreshment are at your own expenses. klm.18, Abeokuta/Lagos Expressway, Lala town. Beside Bayak Filling Station, Along Obasanjo farm Akinjole on Obada Oko Road. Ewekoro LGA, Ogun State.